In Japan, everything sings or has a theme song. It’s a part of the wonder of this nation. Today, I rode home on the Jumbo Ferry: Kobe to Takamatsu in three and a half hours. And the Jumbo Ferry had a theme song. You see a piece of it above, best as I can remember. It lasted about a minute or two, and they played it before every announcement. The singer sounded professional, along with a moving accompaniment. During the song, the wind in my hair felt like that of a tropical cruise. It was alarmingly relaxing. And I tell you, until I listened to that song four times, I never realized how poetic the words Jambo Feeri sound. The English translation, “Jumbo Ferry,” does not capture the heavenly ring. In Japanese, Jambo Feeri has a poetic essence to it, like “vermilion” or “tenderly.” As we drifted through the forested islands of the Seto Inland Sea, the gleaming sun setting before us in grandeur—another one of those poetic words—the gentle melody of the Jambo Feeri song captured the moment in my heart. Boats aren’t the only things that sing in Japan. I visited my friends in Osaka who live in a high-tech mansion with a talking bathtub—it tells you when it’s done filling. Their washing machine plays a six-note tune at the end of a load, as does the rice cooker (a different six notes). Every train station in the country plays music for about ten seconds when a train arrives. I don’t know how the station employees stay sane. And—my personal favorite—garbage trucks play their own songs as they drive around town. I can’t tell you how long it took me to track down the source of that last haunting melody. My neighborhood has a series of alarms and bells. The most major is the noon bell, which sounds like an air-raid siren and lasts for about 30 seconds. It lets everyone in town know to take their lunch break, because everyone in Japan eats lunch at exactly noon. The other bells actually have melodies. I live within earshot of 2 preschools, an elementary school, a high school, two temples, and a low-income apartment complex. At 6 a.m., the first song goes off. If I happen to be awake, I can hear it in the distance, faintly. I’m sure it’s from a temple, because traditionally the neighborhood temple would ring the big gong at 6 every morning, and Japan has carried that tradition to the present in the form of neighborhood jingles. At 10, I get a tune from one of the preschools. But schools in Japan don’t mess around with their bells. A buzzer or dinging noise would be tactless. Instead, each school has a unique song that plays for 15 seconds when the school starts and ends. The last noise comes at 6 p.m. In ye olde times, a gong from the temple signaled the end of the work day at that time. Where I live, 6 p.m. is like the traffic wreck of neighborhood jingles. The first temple begins its tune, and the second temple follows suit a few seconds later. Then, out of nowhere, the apartment complex goes off! It’s a song to rival the temples’, and for about ten seconds, all the recordings are playing, echoing off the Asahi steel factory to double the sound, and you don’t know up from down, Bach from Mozart, or if you should be waking up, eating lunch, or going home. And then, quick as it started, one by one, each speaker shuts off in sequence, until the apartment complex’s last note ricochets off Asahi, and all is silent save the frying of tempura in the kitchen by Japanese house wives. Man, what I wouldn’t give for one of those. I will furthermore speak of the unspeakable, the abominable: stores with looping, 15-second songs. Yamada Denki, anathema to its name, is one such place. It’s like a Japanese Best Buy. If you go there, you hear the same song, loudly, about every 30 seconds. It seems to be an 8-year-old girl trying to sound like an 8-year-old boy singing off-key about the store. Generally, at places like that, rather than making you want to shop there, the songs make you want to buy a power drill—and stick it in your ear. It’s good for your body. The fish are waiting for us. Yeah! It’s all so peppy and happy that you just want to buy groceries, all day and all night. See, aside from the store-wide speakers playing elevator music, they play localized product songs out of ordinary tape players plugged in all over the store. It’s too much! Too many fruits! Too much music! The beauty has turned to horror! The joy has turned into an amorphous amalgamation of fructose-laden dribble. And to top it off, as your will is breaking, you hear a square-wave version of Is it unusual to be loved by anyone. And that’s the end. Your sanity departs, lost forever. Broken, you return to America, another missionary casualty of Japan, burnt out and defeated. 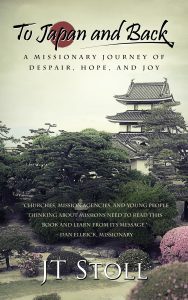 In the years to come, you write about why Japan is the hardest mission field in the world: everything sings. Beyond idol and job worship, love of money, the historical rejection of the gospel, and the compromise of the church; beyond busyness, the high cost of living, and centuries of post-modern double-think that makes apologetics and reasoning impossible, one overriding fact remains: everything sings in Japan. Everything.